Why consume an industrially produced apple sauce when you can make your own homemade compote? The apple sauce recipe is really easy. You will have a natural dessert, light and fruity, in a short time, and especially with little effort. The list of ingredients is short, and above all, very natural. You can also use this recipe to take advantage of any apple you see very ripe. Cooking recipe to prepare an easy apple compote step by step.We can use a peeler to obtain it, but we must avoid the white part as much as possible. Another important point is that the skin is well cleaned and preferably, it is a bio orange or untreated, to prevent your skin is impregnated with pesticides. The orange peel can be used in ribbons or pieces, in the same way that it is peeled off with the help of the peeler. Once the orange is peeled, we will reserve your skin. We will also take care of the apples . We will leave them already peeled and we will remove the center with the seeds and the heart. We will also leave them cut into pieces (it does not matter if they are not uniform or that they are not well cut). Do not throw the skin of the apples because according to the taste of each one, we can incorporate a part to this recipe. I usually do it because this gives more taste to the compote and more fiber content. Next, heat a pan with 350 milliliters of water, sugar, lemon juice and orange peel. Let this mixture boil so that it forms a slightly thick liquid, like a kind of syrup or syrup. Once it has boiled, we will add the pieces of apple we had previously peeled and cut. Then add the cinnamon powder or cinnamon stick. We will leave this mixture cooking for about 30 minutes, with the pan ta pada It is important that the fire stays low to prevent the preparation from burning. After this time, the mixture should have taken a golden color and the pieces of apple should be practically undone. If necessary, we can let the compote cook a little more. If we see the mixture too dry, we can add a little more water. A once the compote is cooked, we can stir it a bit more with a wooden spoon to uniform the consistency. This is also the right time to try the seasoning of our recipe. If it is not sweet enough, you can add a little more sugar. Otherwise, to remove a bit of sweetness, you can add some water or more lemon, or both. Do not abuse the lemon to avoid falling into the risk that the compote will become acidic. In any case, after making the adjustments, you have to stir everything very well. 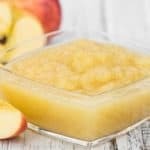 In principle, applesauce is not a preparation of totally uniform consistency, but lovers of homogeneous textures can pass the preparation by a blender or robot. If that is the case, you have to remove the orange peel before processing the mixture, and the cinnamon, if it was added in the branch and not in powder. For those of us who follow the traditional style, without helping us with the blender, we still have to remove the orange peel, and also the cinnamon stick, if it was the case. That's it.In fact, this recipe is a good idea to take apples that are already very ripe. This preparation can be used as a dessert, served alone or sprinkled with more cinnamon. Some people use it to feed babies that begin to consume nutrients other than milk, or even to fill cakes. 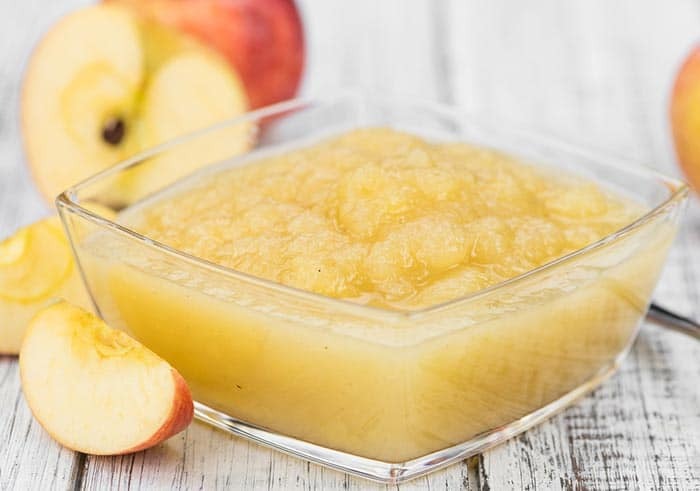 On the side of salty food, Apple compote can be used to accompany certain meat dishes. You can also take this apple compote to accompany some homemade crepes, a breakfast with some banana pancakes, or some American pancakes. If you're interested in other apple recipes, try this homemade apple pie, an apple sponge cake, or a traditional apple pie.